You've heard of a ghost pirate before, right? So, is that a pirate that has died and become a ghost, or is it a ghost that has taken to piracy after its demise? 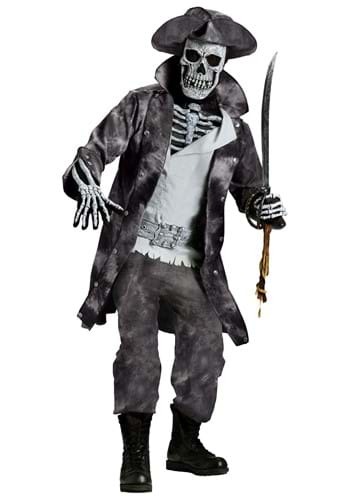 It's a tough question, but if you're wearing this super spooky Ghost Pirate Costume, we're sure you'll figure it out! Pirates are already scary when they're alive and well. So, running into a swashbuckling skeletal specter could really rattle your bones! But, we're still not clear on if this phantom has always been partial to the pirate lifestyle, or if he had a whole different path in mind before he kicked the bucket. Being a terrifying ghost would obviously make intimidation easier, and getting hit during a sword fight wouldn't be quiet the career-ender that it is for a sea dog with a heartbeat. But on the other hand, what would a ghost pirate even spend his plunder on? Food and rum would be a waste of good treasure, since it would just cartoonishly fall right through their ribs onto the deck. Hopefully, this creepy pirate getup gives you some insight, and it also makes a great Halloween costume while you're contemplating these questions! The garments look tattered and faded to match the spooky latex skull mask and printed skeletal details, to give you an otherworldly pirate look. Add a pair of buckled boots and a fearsome sword to complete this haunting style, and show everyone what it means to be a ghost pirate!